Vehicles are produced and used within a complex industrial enterprise, and it makes no sense to isolate the emission performance within the context of a household. Most projects that have examined the charging regime of EVs, such as the recent electric vehicle trial in Victoria, have shown that managing the additional load of EVs will be critical. Fortunately, the preferred charging regime for most regular users of EVs will be overnight, when there is also spare system capacity. This will mean that achieving emission reductions will need to focus on baseload, or renewables (such as wind) that operate overnight. The UK report also considered sustainably produced biofuels, the future of which remains unclear at this time. Turning to solar, Musk correctly identifies the key strength of distributed solar and batteries. Around half or more, of residential and commercial electricity costs are the costs of distributing electricity. If electricity can be generated locally, and supported with storage, there is the opportunity to support the network during the day and early evening. But if we adopt Musk’s strategy of deploying solar and batteries to function as a universal baseload power source, the need for oversized solar capacity to manage through the winter and batteries is self-defeating and will blunt decarbonisation efforts. 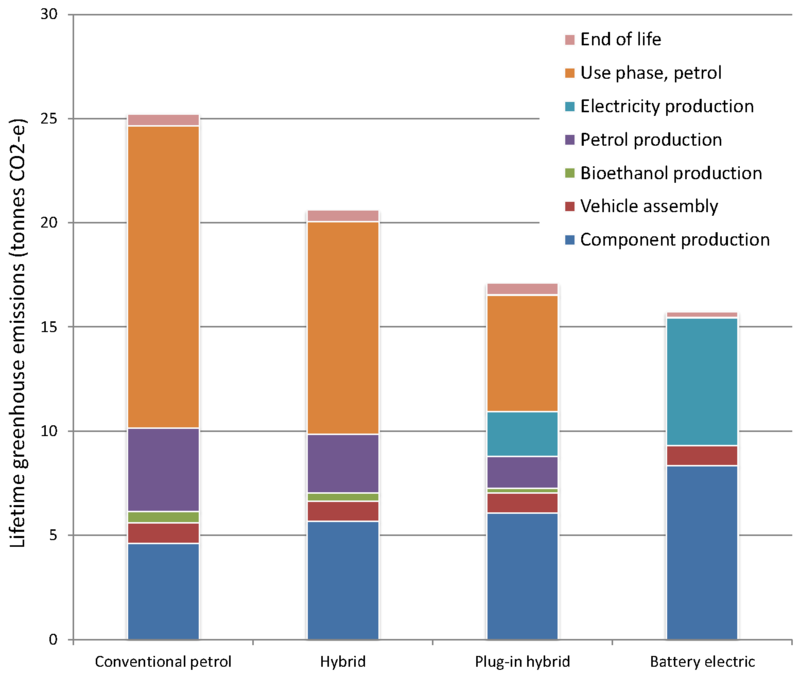 If we take recent LCA data for lithium-ion traction batteries of 586 MJ/kWh, and apply this to a nearly-off-grid system that will power the average Victorian household for 95% of annual hours, the EROI calculates to less than 2:1 after 30 years – the system takes around 15 years to pay back its embodied energy debt. The use of such a system to power a regularly driven EV during winter would be even more demanding. Such as system can work in isolated cases when supported with external energy, but adopted universally, couldn’t support an advanced society. Morgan describes this as the Catch-22 of energy storage. Rather, the judicious use of solar and batteries, driven by tariff reform that better represents the value of distributed energy, will improve the productive use of the grid rather than undermine it. However aligning tariffs with costs is notoriously difficult because economic efficiency often runs counter to fairness and any change inevitably brings winners and losers. The main weakness of Musk’s presentation is that he is promoting the “technology as energy” fallacy, which is the notion that technology emerges out of ideas without a material and energy trail. When any new energy is introduced, it necessarily draws on the capital and resources of the incumbent industrial and economic enterprise. In time, new energy sources introduce advantages that supplement and replace incumbent sources. But the “infiniteness” of the primary energy source does not necessarily reflect the energy available to society. Indeed, for most of human history, societies lived within a bound system of indefinitely renewable solar energy, and most people struggled to live beyond a basic subsistence level. The EROI of the energy converters is the critical determinant of its usefulness, rather than the quantity of energy “out there”. The business and regulatory model for electricity utilities impairs innovation, so it doesn’t hurt to have entrepreneurs occasionally throw a spanner into the conventional distribution model. The genius, or irony, of Musk is that he may ending up making a bundle of money selling the idea of grid independence with distributed energy, while improving the productivity of the grid and baseload power. This converts to about US$356/kWh (US$356 billion per TWh) of energy storage capacity. That’s around ten times the cost of pumped hydro. The residential cost of electricity in California (March 2015) averaged ~$0.17/kWh. Powerwall is a bad deal, costing almost twice what California’s residential grid electricity does. If the $5/kWh cost of absent electricity claimed by Matthew Wald (cite not given) is correct, Tesla’s PowerWall is an excellent deal in a world of rolling blackouts driven by lack of dispatchable generation… just what you’d expect to come out of the Green mania ruling California today. Yes you are correct about the current cost of batteries being about $0.4/Wh. Elon said in a statement the other day when he gets his factory running and new technology implemented (dual carbon battery?) his target is $.1/Wh or $100/kWh. Pumped hydro is nice if you have it. Texas doesn’t have it and EV’s can’t have it. Peter, storage that is embedded in the distribution network has a different role, and a different value to large-scale storage connected to the transmission network. Costs are evolving. The current energy-based tariff structure does not align costs with benefits of distributed generation. Costs of energy storage (other than PHES) are an order of magnitude too high. And we are not going to go off grid. The grid is providing an ever increasing proportion of electricity, not less: http://grist.org/climate-energy/a-way-to-get-power-to-the-worlds-poor-without-making-climate-change-worse/. Batteries have been around for 215 years. It stretches credulity to expect there’ll be a suddenly breakthrough that reduces costs of energy storage sufficiently to make intermittent renewables a reliable dispatchable power supply. I agree Texas doesn’t have viable pumped hydro storage sites. Australia doesn’t either. My argument is that we don’e need it. We have effectively unlimited nuclear fuel and no storage required. The energy is stored in the fuel until needed, just like the energy is stored in the fuel in your car until needed. EROEI is a useful metric, however it is limited because we don’t have an adequate economic method for linking it to the dollar value of energy or the CO2 emissions from producing that energy. Consequently we may have solar/battery systems that may begin to make financial sense but not environmental sense. Ideally all energy prices should include all the externality costs for CO2 emissions. If these costs were carried forward to cover the embodied energy within products, then systems with poor EROEI would simply fail on economic grounds. Think of the development of a complete fleet of nuclear plants financed through the government as being like public transportation. On paper it might be cheaper. However a microgrid at home offers features not available from a publicly owned system. The microgrid is like owning your own car, having more independence, being able to do neat things on your own. You will be willing to pay a bit more for that independence and additional features the government cannot provide. You are quite right Gene that home systems could offer energy independence for not much more financial outlay. My point was however on the disconnect between what makes financial sense and what makes environmental sense. The EROEI is a measure that hints at this disconnect. Ultimately the big picture is to slow climate change by reducing total GHG emissions. Both coal and solar/battery systems need a full accounting of “externalities,” if not they both can make good financial sense. Elon is building an EV empire. The home batteries are a natural extension of his vision and design. With the home battery he will be able to move energy from sources to the EV without invoking peak demand charges from the utility. We could have an alternate future of manufactured fuels from nuclear power but that future has not happened. So we have to work with Elon to try to make his scheme work. I know that just solar power is going to fail him. But a combination of nuclear and solar might work, even though its not the lowest cost solution. We have to visualize a total integrated system. The purely nuclear vision seems unlikely at this time. I have real trouble believing this argument. It seems it is still being driven by beliefs rather than rational economics and rational analysis. Such approaches don’t succeed over the long term. They are not sustainable. We’ve seen so many of them over our life times, that I am strongly persuaded, only economically rational solutions, where nearly all stakeholders are winners succeed. That means they must be economically rational. I’ve read a lot of analysis explaining that the Tesla system is a major boondoggle and not financially viable. It’s a great sales job. But will inevitably come unstuck. It;s the same sort of wishful thinking that has driven the huge rate of growth in renewables to get solar to about 1% and wind to about 3% of global electricity supply. I am not persuaded. Residential consumption is relatively small component of total electricity, so not the main game. Some one has to pay for the grid when some people elect to go off grid. The cost of infrastructure to serve the whole area will have to be partly moved onto rates, just as a suburbs roads and water must be paid by everyone. All that has yet to come, so there will be less advantage to move off grid. The cost of renewables and batteries is very much higher than claimed. And I don’t believe the gap can be reduced sufficiently to make them viable to replace grid electricity. Nuclear has demonstrated it can provide 75% to 80% of a major industrial country’s (France) electricity for over 30 years, And provides nearly the cheapest electricity in Europe. The technology is well proven. The current high cost of nuclear is not inherent in the technology. It is caused by regulation. So, that can be fixed (over time). The cost of nuclear power has the potential to be reduced by orders of magnitude over decades. There is not technical block, just regulatory impediments blocking progress. Conversely, renewables are not sustainable. They cannot provide a large proportion of the world’s current or future electricity demand (based on the >200,000 year trend of per capita energy consumption since primitive man). The most important criteria to consider in all policy analysis and advice for long term sustainability is what is economically rational. if the proposed policy is not economically rational it cannot susrvive. Musk has explicitly stated that the PowerWall you can reserve today is not for time-shifting PV. There’s no sense in time-shifting if you have net metering. The PowerWall is for backup purposes only, capable of only one cycle/week. It is there to keep your lights on when power shortages force rolling blackouts in California. In other words, it’s a way to escape the consequences of pols siding with Green pressure groups. Have been writing and refining this article attached. You can post it if you like. The second graph is based on the infamous Weißbach et al paper, who cherrypicked their EROIs. For renewables they picked the lowest values they could find in literature. For nuclear the best they could find. The BREE link did not work for me. To develop nuclear will require centralized planning by the government. Neither Australia nor the US is providing that role at this time. We know that renewables aren’t going to hack it or be affordable at the grid level. Ive confirmed that. So the only other option is for individual customers to take control and the only way to do that is through microgrids. We present pro nuclear arguments that continue to fall on deaf ears and nothing happens. At least Elon is taking action. Our existing highly progressive rate structure, for the big three, is in the process of being modified as discussed by Dr. Borenstein. Estimating the price of a kWh of electrical power for future investments in EE, PV, batteries, etc. is subject to a fair amount of uncertainty in CA. Dr. Richard McCann covers some equity issues that the CPUC is addressing- https://mcubedecon.wordpress.com/2015/07/02/equity-issues-in-tou-rate-design that will likely impact the 569 households and businesses that installed PV systems in my small country over a recent 12 week period. 47% of the installs occurred in one, of 5, supervisors district. This same district has the highest number of ZNE homes in the county and the average household has enough disposable income to consider a Telsa/PV/battery option. The EIA data masks a lot of variability in the price different residents in the state pay for a kWh of electricity. A friend in Daly City, who works a lot of hours in SF almost never goes above the baseline level for her home (hence her AVG and marginal price for a kWh of electricity is currently $.16, up from $.13 kWh last year and soon to be somewhere between $.20 to $.24 kWh it seems. My in their late 70’s in-laws pay a marginal price of at least $.22 kWh from PG&E on their TOU rate schedule. Neither of these homes have air conditioning (although my in-laws wish they had something this last week as it been hot in their foothills location). Last week my wife and I headed out for our weekly pizza lunch at a newly remodeled facility a couple of miles away. We are experiencing a rather persistent high pressure ridge in our area which causes the temperature to reach close to the daily maximum (97F) by 11 in the morning. It stayed HOT till about 8pm when the sun finally went over the horizon. The owner of the pizza parlor noted that it was a Cha Chang day as her PG&E costs for the day were going to be painful. If one uses the EIA data for the CA “commercial” sector’s Avg price per kWh one would assume the owner of the pizza parlor, who leases the building, was paying around $.141 kWh-up from $.123 last year- for her HVAC usage. PG&E’s A-1 TOU commercial rate schedule was updated on June 1, 2015 http://www.pge.com/nots/rates/tariffs/rateinfo.shtml and the pizza parlor owners actual price per kWh is a lot higher than the EIA CA average commercial sector price per kWh: $.24 kWh at partial peak time when we had lunch. Pizza parlor’s in different electrical service districts in CA must be paying less than the EIA reported Average commercial price for a kWh of electrical power as the Pizza Parlor I frequent (PG&E’s service territory) are paying about ($.10/$.141)*100 70% more than the EIA report average price for a kWh. We gave the owner of the pizza parlor two dollars to help cover her operating costs for the day. I have a feeling that our price for a lunch special is going to go the way of the dollar menu at McDonalds. My SWAG is that the special will be at least a dollar more next year (a 16% increase) or the drink included in the special will be eliminated. Elon’s home system is just an extension of what is already happening here in the US with commercial loads. The really important thing about the Tesla battery is absolute price, not anything complicated like EROI. Something happened, which was unthinkable just a year ago: People building a house will include a battery, because the price of the house will not really change. and this will of course completely change EROI for future battery systems completely. So a EROI number calculated on data from today is just plain out false and seriously missleading if you want to judge the value of a power “source” under rapid development. Sod’s referenced article effectively states that the value of battery storage 20 years into the future for the whole of Australia’s National Electricity Market (NEM) is projected by the regulator to average a couple of MW into or returned from battery storage at any given time. Storage capacity of 8000 MWh is negligible on a grid-wide scale. The net benefit of such a battery array would be only a few MW during peak demand periods. This isn’t news. It is trivia, akin to doing away with the contribution to morning peaks due to free to air TV breakfast programs, or perhaps that of afternoon children’s programs later in the day. Why not rant against free to air TV during peak hours? It is irrelevant. The remainder of his rant against use of EROI as a tool for evaluating… (yes) energy return on energy invested… (wait for it, it is an elusive concept) is merely wishful thinking nonsense about the value of fictitious hypothetical future battery storage. Perhaps the Moderator will delete this message. I won’t mind, provided that even sillier messages are filtered at the same time. I guess they must have made a mistake right? 2. All power grids need to be balanced with their loads somehow and this cannot come from solar, whether thermal or PV. Even solar thermal with storage is good for only part of a night, and then at reduced loads. Solar is viable primarily in systems which have overcapacity in gas turbines. Right or wrong? Clearly, Engie are acting as niche players in niche markets. As also the antique Hazelwood dinosaur in the NEM is only a minor player with an exceedingly short economic future. This is a careful estimate about a new technology. I would expect it to underestimate the total effect. This also is about absolute numbers and NOT about storing significant amount of the annual power output. In the future, solar PV and home batteries will remove peaks and flatten gaps. That is good news for renewable power. I am not against EROI, i consider it a good concept. But not, when talking about a very new technology. Most of those houses would achieve a much better EROI, if they got better windows or other insulation instead of a battery. But the long term effect might be much bigger for the battery, as it is changing technology. I actually do not expect that the majority of early adopters of a house battery will do it for the greater good or even for sound economic reasons. Many will just enjoy the fact that their lights will keep on, when those of other people go out. PS: I have seen many people making the claim, that a diesel generator is the better backup. They also fail to see that the diesel is not plug and play, as the battery is. Solar may finally come forward more cost-effectively, and batteries may advance more quickly than they have. There are certainly excellent, idealistic and dedicated engineers working on the related issues, and forward potential for the technologies. If solutions to the efficiency and storage problems are developed, solar can help. Not much, it seems, against the scale of the problem – – an issue eternally avoided in by the “we-can-do-it-all-with-renewables” advocates – – but it can help. So thats nice. The Company’s perspective turns out to be quite different when not filtered through the renewable energy echo chamber. The point being that the energy system numbers don’t work for renewable energy, and they are unlikely to work in any time frame in which the human species would do best to address the issues of climate, energy and poverty, i.e., over the next few decades (and also over the nearly three decades already lost as policy makers chased the renewable energy illusion while simultaneously degrading, abandoning and avoiding investment in promising nuclear technologies). This point – – that renewables are woefully inadequate, was first addressed thoroughly on this blog in the TCASE series. It has subsequently been developed and refined by many thoughtful commenters. It has never been disputed with sound analysis. Please post a notification here when wind and solar add more delivered kWh than are added from coal, on a year-over-year basis. Thats the point when, in my view, your assertions may become worth attending to. When I have followed out your links and investigate, the contentions you assert, like the one above, fall apart. I also suggest that a perspective so devoid of numerate analysis and factually verifiable content doesn’t merit the dismissive sarcasm you seem to favor. And i think that this will be the situation in most of the western world and battery storage (our topic here) will even increase that trend. So in a country that is in the economic doldrums, with electric consumption roughly the same in 2014 as it was in 2006, heavily subsidized and often-mandated unreliable electric generation resources increased their share from 2.32% in 2010 to a whole 4.89% in 2014. Meanwhile, the nuclear industry that so many are waging lawfare to put out of business made 19.4% of total US electric generation in 2014. That was 63.5% of all carbon-free (non-combustion) generation in the USA last year. I’d be perfectly willing to watch you commit suicide via climate catastrophe, industrial and societal collapse or both, except that I can’t boot you off to your own planet to destroy and leave me alone. If you were sensible you’d get rid of your tunnel vision on ruinable generation and look at fossil fuel consumption for electric generation. Sadly the published figures for fuels only go up to 2011, but we can see that between 2006 and 2011 the heat-rate for coal-fired generation went from 10312 BTU/kWh to 10409 BTU/kWh, and the heat-rate of gas-fired generation went from 8138 BTu/kWh to 7942 BTu/kWH. The efficiency of gas-fired generation went up about 1 percent but the efficiency of coal-fired generators went DOWN about the same… and due to the higher CO2/BTU of coal, CO2 emissions per kWh stayed about the same or went up. You would rather run in place with ruinables and batteries (with how much fossil fuel invested in each kWh of storage, lasting how long?) than build carbon-free nuclear that lasts between 60 and 100 years. Precisely WHAT is WRONG WITH YOU?! The EIA noted that the coal fired facilities that are being retired had average capacity factors of 24% – ie they weren’t used much. It will be interesting to see how the Watts Bar facility scales up. I assume they are targeting 90+% capacity utilization sometime during 2016. The new utility scale “Solar in CA (1.2 GW)” noted in the EIA data should have capacity factors around 22% or so. It will be interesting to check back at the end of 2016 to see if the TVA Watts facility generates four times as much power as the 1.2 GW of new CA solar. Sod – In the US, gas has been pushing out coal, and, but for subsidization and mandates, pretty much everything else in the US. This has been a local phenomenon. I was thinking worldwide when thinking when I indicated that an increase in kWh of solar over coal would become of interest when it is accomplished. The energy, environmental, air and poverty problems are worldwide. I should have predicted, however, that a challenge over cherry picking would be met with cherry-picking. As for the Engie website, it states their position without the statement being filtered and reconfigured in the renewable energy echo chamber to appear to have stated something else. Great article – but sorry, I’m confused by the comment “But if we adopt Musk’s strategy of deploying solar and batteries to function as a universal baseload power source, the need for oversized solar capacity to manage through the winter and batteries is self-defeating and will blunt decarbonisation efforts.” – especially the second half of the sentence which I am having trouble parsing even grammatically – would you please explain? Baseload power sources must, by definition, be reliable. By that is meant, able to provide, reliably, continuous power at the desired frequency, voltage and phase angle, despite vagaries of weather. Solar and wind are not able to do so, either with or without batteries, Elon Musk notwithstanding. Issues include the need to massively oversize the renewables and battery components in order to ensure that power is available 24/7 during periods, such as today across much of the NEM, with low temperatures and low solar power. At other times, eg during wide spread mid-winter Highs, the wind portion of the system is severly limited. At all times, frequency control is reliant on either base load or hydro. Thus the phrase “the need for oversized solar capacity to manage through the winter and batteries defeats the decarbonisation efforts” (NB slight re-wording is mine. This defeat is primarily because oil and gas fired peaking plant (GT’s) would then be needed t make up any shortfall. Why opt for GT’s, wind, solar and batteries, all in large amounts, when a substantial amount of the load can be produced by other, carbon-free methods? The killers, in the final washup, are the fossil-fuelled GT’s which are essential to the solar dream, batteries or no batteries. But at least the GT’s can provide frequency and thus voltage control. Elon isn’t thinking in terms of base load, peaking, etc. Those are grid concepts. @ Gene and singletoneenginner – thanks gents – I am quite familiar with the frequency stabilisation problem created by non spinning reserve and the whole systems LCOE and other issues that make VRE with battery storage a non-viable solution for reliable and long lasting supply (either on or off grid). I agree solar would have to be oversized. This why a home microgrid would be best served with maybe 1 kw nuclear capacity and 5 kw solar on their rooftop. Indeed, Gene, those terms are grid concepts. They also make sense at small, smaller and smallest scales. Besides, when you subsequently mention microgrids, you demonstrate finally that grid concepts are relevant. Grids are, at base, the means of connection of generation capacity of any types to loads. This, of necessity demands that several conditions regarding reliability be achieved, including regulation of voltage and frequency, matching phases of loads and generators, and matching power loads with power available. Every one of these conditions must be met and not exceeded. Well base load is a grid concept. I think nuclear when I think base load. Im sure Elon is not thinking nuclear. Hes a solar and battery guy. So hes probably thinking a large solar panel, maybe 10 kW with a large battery for a microgrid. However its easy to show that a small amount of nuclear capacity ‘base loaded’ fed to the house micro grid allows a smaller solar panel, 5 kW, and a smaller battery also since the production of power and the consumption of power are more closely aligned so its not necessary to have as large a battery. The economics of a microgrid will work out to be lower cost for a combo of nuclear and solar and battery. Here is an interesting observation I had the other day. A local person was suggesting stand alone off the grid with solar and batteries. But the article they were referring to talked about homes sharing their solar power and batteries. I pointed out to them that the only way they could share power between homes was if they remained connected to the grid – ouch! Also that large nuclear plant serving a few million homes directly to their microgrids would of course need to be connected to the grid. In the end it will be in everyone’s interest to remain connected to the grid. But funding a base load nuclear plant by utilities is out of the question unless they have really good regulatory support. I think a million homeowners might be able to fund a nuclear plant more easily than a large utility, and I’m thinking about here in ERCOT, not Southern Company or TVA which already are set up to fund and build more nuclear plants. So, Gene seems to believe that there is no need for commerce, industry and so forth. Or for electricity in lower level housing units, shaded townhouses. Or for hobbyists with lathes, welders, etc. Or 24/7/365 essential services such as hospitals. Or water and sewage pumps. Or electricity for railways and other forms of transport, post-fossil fuels. Or even for mobile phone and internet service providers. What a sad, energy-hungry world to wish for! The vision of 1kW households pretty much won’t even supply a small caravan, let alone any of the above. The rest of us, who live in the real world, place a high value on both domestic and non-domestic uses of electricity and we value the grids which distribute it, the systems which enable security of supply and the equipment which manages the quality of the supply, eg frequency control. I doubt very much that Elon Musk is proposing to personally revert to a hunter-gatherer lifestyle plus power only for 1kW of insecure essentials. Like Elon, I choose a less restricted lifestyle also. Seriously, those who, like Gene, espouse a minimalist, domestic-power-only vision of the future are promising an empty dream. Attempts to sidetrack the discussion of the world’s future energy options along such utterly inadequate pathways is infertile; a wasted opportunity and an insult to the intelligence of the audience. singletonengineer, my key arguments were that distributed generation and storage can take on some of the traditional grid functions and provide grid support, but cannot substitute for baseload. Gene has taken this idea one step further and articulated a potential model for exploring the potential synergies of the incumbent network, low-emission baseload, and microgrids. I think both Gene and I agree that it doesn’t matter whether we share Musk’s vision or not if the outcome is affordable, integrated hardware. I don’t see where Gene’s comments reflect a minimalist, domestic only vision? I totally agree with you. The concept Elon is promoting is very limited. Hey I did say we need nuclear power didn’t I. That requires a grid and centralized planning and a supportive government. I was just giving Elon’s point of view also and suggesting his microgrid might inadvertently allow individuals to invest in nuclear bypassing traditional obstacles to nuclear power, so in a sense he might be a way to get nuclear started again in the US. Its a long shot. Actually I think we need to radically increase energy consumption and think of energy as a way to solve problems like hunger, solve climate change using more energy, build exotic flying machines, etc sci fi to the max. Im the opposite of a minimalist. We could increase energy consumption by a factor of 10,000 per person world wide and have enough energy to last about 4 billion years according to my estimates. Thanks, Gene and Graham for dealing with my comments gently. On re-reading the last few comments, I realise that I misunderstood your argument – possibly thrown sideways by discussion of 1kW fission powered generation in a microgrid. I’m a big grid boy – the more connectivity, the less need for spinning reserve, frequency control and other services. I am not convinced that microgrids are competitive on cost or reliability grounds. I might be wrong… I’d like to know more about just what the term microgrid means in this context. The microgrids may not be cost competitive compared to larger grid projects but look at the funding. Obtaining billions for large projects on the grid raises rates. The microgrid owner may invest heavily in their own projects for other reasons and their investment cost doesn’t show up as a cost to the grid. So in considering overall societal costs, also consider who will be paying for the improvements. I think the microgrids model should be viewed as an emerging technical model with potential, but as yet, unknown costs and benefits. Gene is imagining bolting a financing model onto this. Other financial models are already available. The evolution of power electronics, such as IGBT’s, and digital control has evolved so much that a lot of small scale AC interactions that were impractical or costly 20 or 30 years ago are now routine. The high cost of distribution means that distributed storage can be costlier but still valuable. But this doesn’t mean that microgrids are self-sustaining from an energy perspective. Trying to understand the synergies between the conventional system and new models is one of the challenges. The train is moving and there will be a lot more rooftop solar so there’s no point in standing in front of the train. I was highly influenced by William Alexander’s talk at an IEEE power engineering society meeting about a month ago. They make the 30 kW converter selling for less than 10 k$. We were stunned by what this little box does, handles solar, storage, EVs, demand charge leveling, and even off the grid operation. The web site does not really do it justice: http://www.idealpower.com/cases.aspx and look at the small size of that box in the lower right hand corner. The guy is also designing his own AC gate operated switches with ultra low loss. I saw a genius talking and we were all left with our jaws hanging in amazement when his talk was over. He says the reason hes not building a 10 kW unit for residences in Austin is our rates are not high enough and are not structured to make the microgrid economic at this time. However in California they are selling well. William says we can use 30 cents per watt as the cost of his converters. A 10 kW (microgrid) converter would cost $3000. This is a fantastic piece on the nuclear industry’s ability to lie to itself and everyone else. EC has linked to an article and report which are predictable output from dedicated antinuclear writers. Further, there is nothing in these clearly biased writings to justify use of “nuclear industry’s ability to lie to itself and everyone else”. Inflammatory language such as this does nothing to advance knowledge regarding the best, rational responses available to defeat the challenge of climate warming. Isn’t that what we are discussing? If not, then is the objective just to throw insults around? In some ways, EC and I are actually on the same side, but this is yet another post which demonstrates the logical fallacy which is that some believe that their favoured energy sources will somehow perform better if nuclear power options are removed from consideration. This is not a zero sum game. One option’s loss is not another’s gain. EC’s blindfold re nuclear power is no use as a tool with which to optimise the world’s climate and energy futures. He should get rid of it. “from dedicated antinuclear writers” Can we make a list of these writers? Is that information organized in such a manner that they can be identified as consistent anti nuclear writers? I would be interested in understanding why they are not as concerned with excessive CO2 emissions as they are concerned about peaceful nuclear power. There is one dedicated anti nuclear writer in my town who was general manager of the local power company here for two years and while he was GM, the utility web page talking about a nuclear plant here in Texas had a picture of a mushroom cloud posted on the same page as the information about the nuclear plant. Of course when he retired and the new GM was hired, that image was removed. But the intention of the anti nuclear fellow was to create a sense of fear in people’s minds that the plant might blow up. I suppose that is it isn’t it, the fear of a nuclear accident? A local professor here at the university once stated to us listening to his talk that engineers see nuclear as a solution whereas lawyers see nuclear as a disaster opportunity. I think if we were to look at the backgrounds and education of all the anti nuclear writers we would find that none are engineers. Knowing that might be useful in explaining why these folks are so fearful of nuclear power. The less you know about nuclear power the more afraid you are of the technology. Education is necessary for fearful persons to be able to cast away their demons and find solutions to the atmospheric and ocean CO2 increase crisis. Gene, the list of antinuclear activists would be long and tedious. Better to compile, as has been done on this site and elsewhere (eg http://decarbonisesa.com/who-gets-it/) a shorter list of those who have switched from anti to pro. The linked list includes George Monbiot, for example, who is a powerful voice for the environment via the Guardian newspapers. Journalists, politicians, top scientists are amongst the opinion-formers who can advance the spread of sanity in a warming world. Please let us stay on the Tesla and battery topic here. The home battery could benefit renewables and it could also benefit nuclear power. In the past in Germany, several times it turned out that pumped storage was actually build to support nuclear (night power) and not renewables, as people were told. so i am curious: why are people here so pessimistic about the battery? Hi, sod. I will remain pessimistic about batteries until they are able to achieve today what will be expected of them tomorrow. Expectations of unbuilt, uncosted giga-factories and of as-yet unachievable capacities, efficiencies, cost savings and life cycles are not bankable. Indeed, I am pessimistic about much more than just batteries. I am extremely pessimistic and saddened by the ongoing demand from various quarters that a single emerging technology will make the difference, whether that be gas instead of coal, or solar PV, or wind, or geothermal, or wave power, or batteries in combination with one of the above. No war has ever been won on the basis of a single new tool in the army’s toolbox and the same is true when it comes to climate change. The war to save the planet from permanent damage due to climate change is worth winning. So why aren’t we giving it all that we have? To turn your concluding question on its head: Why are some people so obstinately and prematurely optimistic about the battery? Elon has some new battery technologies he is looking at that may prove attractive to microgrid owners. I doubt there will be large scale penetration of batteries and/or microgrids though. Possibly in conjunction with EVs and stand by power batteries will be useful. Utilities are going to resist giving microgrids access to the real time system larger grid. What I find interesting is that a full out effort to install enough batteries to really make renewables work throughout the day costs more than replacing all the generation on the grid with a full fleet of new nuclear plants, especially Per Peterson’s design that is a combo cycling high temp reactor plus gas peaking capability built into the nuclear design. I agree with your conclusion (it will take many tools to stop climate change), but i strongly disagree with your example. There have been many decisive weapons, but very few would give an advantage over a war, as the enemy would simply adapt and for example use the weapon himself. The situation with climate change is very different. I can also understand some scepticism towards batteries. It is a technology, that has not shown its full potentials so far. .
people were constantly complaining about the lack of storage for solar and Co. Now we have storage, and people dismiss it with a wave of one hand. batteries were rumoured to be 3 to 4 times the price they are now. And we did not know about daily cycling and the 10 years warranty. This also never gets mentioned at all! I think the major problem with having to rely on batteries is they add significant cost without adding any energy or being a source of energy. Its usually very difficult to economically justify energy storage in system studies when there are other competing power sources. I’ve been there, done that, with pumped storage economics studies in the past. Of course for EVs the batteries are necessary, unless someone invents a nuclear powered car LOL. Having an EV with a large battery parked in a homeowners garage justifies having another stationary battery near the EV for performing super fast charging. This super fast charging is not possible from the service drop to the home which has limited capacity. Batteries at home can smooth out this problem and make the power grid more cost effective. The economics for a home battery like Elon is suggesting is a clear winning technology because there is no competition for powering cars unless a CO2 neutral fuel could be produced, which might be possible. However energy storage out on the grid has economics that looks just awful. I think Elon has a niche market here. Lets see what he can do with it. I have a few memories of terrible problems with battery-powered DC “uninterruptable power supplies” at conventional power stations, so please excuse my skepticism until I can actually see and touch the finished product. Classic of the nuclear supporters genre Singleton; all the doubt for renewables, all the certainty for nuclear. Lithium ion batteries are far more widely demonstrated than Gen IV and SMRs, and with demonstrable cost reductions over time. And yet, you’re sceptical of batteries and fully, absolutely convinced nuclear is the only option. I should have included nuclear power in that list. Nuclear power is an essential component of a rational response to anthropogenic climate change, at least until something better comes along. Since Evcricket has accused me of being convinced that nuclear is the only option, allow me to emphasize that my position is otherwise. Every low carbon tool which is available now is needed now, while we strive for a better tomorrow. So what if Type IV, SMR’s and grid-connected batteries will not be available till tomorrow? That which will not be available till tomorrow is, by definition, not available today. That does not justify lack of action today. The problem in the US is the cost of licensing and the delays. Here in ERCOT there is not a way to pay for high capital cost projects. This is true for solar also. Solar and nuclear have the same kind of financing problem, how to pay for it. The problems with nuclear are mostly institutional rather than engineering. We have a lot of engineers who think they have solutions and are frustrated by being held back. Many other countries around the world are much more optimistic about nuclear such as France, England, Russia, S Korea and India. I think microgrids and nuclear power would work great together and with a bit of solar. A few years back the CPUC, FERC and the CEC approved a new transmission line in the San Diego area that must be in place by now- The “Sunrise Power Link.” I take it the costs for this new infrastructure project (to move the output of some of the new RES generation facilities contracted with SDG&E to a location that the power can be used) are being allocated in part to the school district by now. I don’t normally try to keep up with what is happening down in the southern part of the state, but it appears that the management of SDG&E would like to start adding a fee to residential PV customers in their service area- I was a bit surprised to see how much they were shooting for: “The amounts of the proposed DDMSF are considerably higher than $10. Specifically, SDG&E proposed a DDMSF plus monthly fixed charge ranging from a low of $27.78 (up to 3kW) and a high of $79.53 (6 kW and above).” See table CF-12: SDG&E Proposed DDMSF for Optional and Experimental TOU Rates (this plan was NOT approved!! I am trying to figure out what will happen to my costs for electrical power from PG&E in the future, this task it a bit complicated as PG&E indicated that they would like to move their TOU rates to a peak time of 4 to 9 PM- see footnote 379 in the approved Residential Rate Design decision- and flatten the price per kWh differential between the different tiers. We happen to need a secure source of backup power- as we get our potable water from a well- it might be time to look into the EV, pv, backup power option in a bit more detail. Back in 2006 it was verboten for us to consider anything but the grid as our battery for the over generation of our little PV system. I happened to notice recently that used Nissan Leafs are rather inexpensive in my area. This article has provided an insight about solar batteries and electrical vehicles. I was a little curious about EROI which is the energy gained form an energy production process. keep on informing us about the solar products in the future as well. This article does also mention the Tesla battery. People in Australia are leaving the grid. The article appears not to support your assertion that people are leaving the grid. At a cost of $40,000 a bill has been halved! I will leave this article as an example of how necessary it is for contributors to read a reference before posting and commenting. Further instances will be deleted. The extreme views taken are perhaps unnecessary. A breeder reactor program can be started worldwide by using the fissiles elements available in a fast uranium cycle and converting to thorium. Th-233U cycle is easier to continue as self-sustaining breeders. The stocks of already mined uranium and lying as depleted uranium or as used fuel can sustain the world for a century or more. Thorium can take over thereafter. Resources required for wind energy can be reduced without exhausting the rare elements by changing technology in following manner. 1. Avoid distant wind farms and have smaller grids close to points of use. 3. Use compressed air directly for pumping water, running farm and home machinery, and air conditioning. 4. compressed air can be converted to electric power but it should be kept to a minimum as an economy measure. 5. Wind towers can also be used to mount photo voltaic panels besides other uses. 6. Batteries are getting cheaper and flow batteries using organic solvents using common elements are only a matter of time. They can be used for all electrical power, where and when required. 7. Fossil fuels use should be generally minimized and suspended matter and serious poisons like sulfur should be particularly reduced.